What true cloud-based manufacturing systems are out there, what can they do, and what types of manufacturers are they good for? 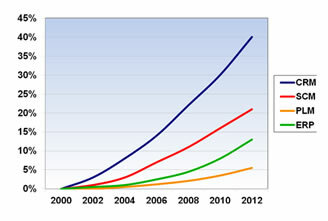 Almost 10 years ago, we made some predictions in our 2004 research report about the cloud and SaaS: “On Demand [SaaS] will substantially outpace traditional software sales in the SFA, TMS and B2B integration arena, with many other segments following suit.” We predicted it would take some time before ERP SaaS took off (see figure 1). Within cloud ERP, there have been differences of adoption rates by industry. In particular, manufacturing firms have been slower to adopt cloud-based solutions. In this article, we look specifically at SaaS offerings for manufacturers, some of the reasons it has lagged in other industries, and what the real requirements vs. available solutions are. When thinking about “to cloud or not to cloud,” it is important to remember that there is an enormous range of types, sizes, and complexity of manufacturers with different needs. 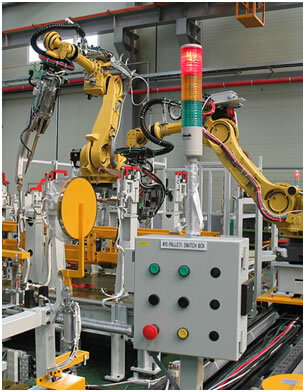 For example, a manufacturer that is doing light assembly may need assembly management, product history, work orders, and a modest level of BOM sophistication. For them, a cloud ERP like NetSuite may work just fine. In fact NetSuite has many manufacturing customers fitting that profile. Furthermore, NetSuite has many of the key components needed by manufacturers of all types (simple or complex). They have strong ecommerce and CRM capabilities, and through their integrated partners, have capable WMS, SCM, and Demand Management functionality. NetSuite has also been making significant investments in those areas within their own suite as well. A manufacturer doing more complex process-intensive or fabrication-intensive manufacturing requires a more sophisticated shop floor control system, production scheduling, tooling, quality, machine integration, possibly serialization/traceability, and more. When it comes to a pure cloud implementation for complex manufacturing (ERP + MES + SCM), Plex is currently the only game in town with that depth of functionality in their MES suite across both process and discrete manufacturing. Infor’s SyteLine offers a cloud-based ERP for discrete manufacturers such as metal fabrication, industrial equipment and machinery, high-tech and electronics. There are other pure-play cloud ERP solutions for manufacturers vying to catch up, such as Kenandy and Rootstock, but they are much younger companies and, though they are moving fast, it takes time to build out this depth of functionality. So what are some examples of sophisticated functionality that a complex process-intensive manufacturer might have for a cloud system? Deep Data Model—The data model for defining parts, process controls, quality parameters, BOMs, and so forth needs to accommodate all of the attributes and characteristics of highly engineered, complex manufacturing operations. Plex, for example, has spent over 15 years building out the data model and made the model user-extensible in almost any dimension, so that any attribute can be added and linked into the system. This allows drill down or search by any attribute (e.g. search for radial needle roller bearings with outside diameter of 2”-2.5”, single seal, self-aligning, made of ASTM A485 - 09 Grade 1 steel). Linkages enable navigating through the system from parts to purchase orders to recipes to just about anywhere that is needed, by associating one element of the data model (e.g. parts) to others (e.g. purchase order). Direct machine interface—The ability to interface directly down to the machine level; a PLC1 or RTU2 or the next level up with a SCADA3 system. Plex can download instructions to individual machines. If an engineer makes a change to a part in CAD, that can be used to change the setup instructions in near real-time, ensuring that the floor is always in synch with the latest design revisions. Workstation control screen—A master control screen for each machine or workstation where the operator can find everything they need—current job and part information, work requests queue, check sheets, machine settings, production history, work center log, gauges management, tooling management, quality management and alerts, maintenance, even HR tools and employee suggestions—all on one screen, right there next to the machine. This is far from a complete list of requirements for complex manufacturing, but is intended to give a feel for the many deeper functionality needs of complex manufacturing operations. What About Security, Availability, Performance, and Scalability? Security—Can I trust having my sensitive data up on the cloud, in a system that may also house my competitors or be hacked by an IP thief? Availability—What happens to my plant if the network goes down? Performance—Can a cloud system respond in near real-time as needed to control my machines? Scalability—Can a cloud system scale up to the large number of machines, lines, plants, and high volume of production we have? These are legitimate concerns, but certainly not insurmountable. In fact, many manufacturing companies are successfully running on the cloud without incident. We will cover these aspects in a separate article or blog post, so stay tuned. There are of course a number of quite mature and deep on premise MES and ERP systems for manufacturers (AspenTech, Infor, Invensys, Apriso, SAP, and many others). Some of these providers have also started to venture into the cloud for selected portions of their portfolio where it makes the most sense. This may be to connect multiple enterprises or integrate multiple systems or connect far flung mobile users. For example, Invensys offers SmartGlance that provides on-demand reporting on smart phones using a cloud based data service. The bottom line is that there are some excellent choices for manufacturing in the cloud that are already widely and successfully adopted. This is especially true for small and mid-sized businesses or divisions of very large corporations. We expect these solutions, their capabilities, and market share to grow robustly for the foreseeable future.